In 1583, as Philip of Spain prepared to invade and conquer England, the British government created a new acting company as part of Secret Service activities including wartime propaganda to promote patriotic loyalty and unity. This new troupe, Queen Elizabeth’s Men, was formed at the express command of the monarch. Drawing the best actors from existing companies, it became the dominant theatrical group in the crucial years leading to England’s victory in 1588 over the Spanish armada. Although printed in 1594, "The True Tragedy of Richard the Third" was performed by the Queen's Men in the 1580's. 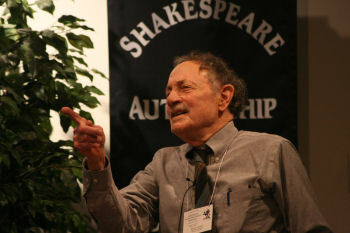 Did "Shakespeare" steal it for his play "Richard III"? Or was the real author, Edward de Vere, building upon his own previous work? During that period the Queen’s Men performed what were, by all appearances and by all logic, early versions of royal history plays by Shakespeare. 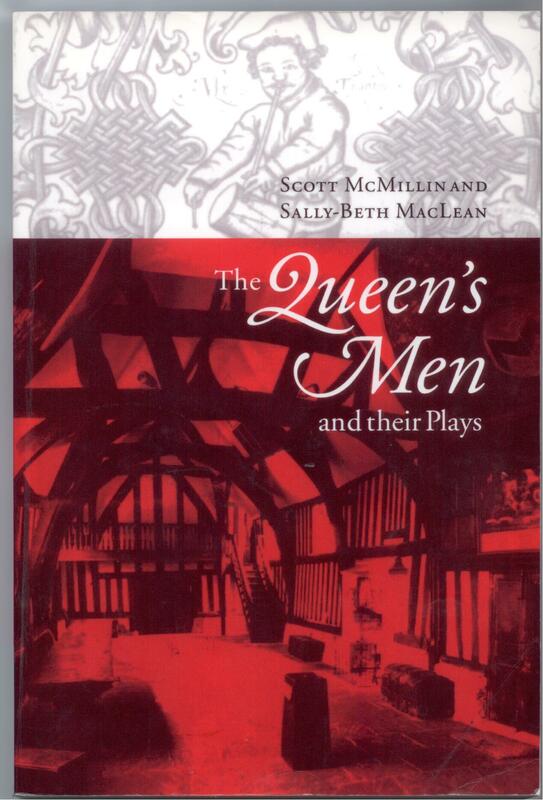 “The plots of no fewer than six of Shakespeare’s known plays are closely related to the plots of plays performed by the Queen’s Men,” according to Scott McMillin and Sally-Beth MacLean inThe Queen’s Men and their Plays (1998). Did "Shakespeare" use this early anonymous play for "1 Henry IV," "2 Henry IV" and "Henry V" Or was "The Famous Victories of Henry the Fifth" his own youthful play? 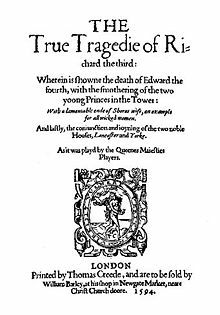 The known plays in this category are The Troublesome Reign of King John, repeated by Shakespeare “virtually scene for scene” in King John; The True Tragedy of Richard III and King Leir, whose stories are fully covered by Shakespeare in his Richard III and King Lear; and The Famous Victories of Henry the Fifth, which forms the entire foundation for the material that Shakespeare covers in 1 Henry IV, 2 Henry IV and Henry V.
The problem, however, is lack of any evidence that Shakspere of Stratford was a member of this prestigious acting company. The likelihood is that he was still back home in Warwickshire when his twins were born in February of 1585, when he was twenty years old. In other words, the existence of early Shakespeare plays performed by the Queen’s company in the 1580’s presents a major problem for the official biography. You might say it blows it apart. By tradition the “Lost Years” of the Stratford man begin in 1585 and continue until Robert Greene supposedly alludes to him in the fall of 1592. By then, for the legendary story to be plausible, he has somehow firmly established himself in London as an actor who is already prominent enough as a playwright to provoke Greene’s jealousy and ire. But this is pure fantasy. “Documentary evidence as to Shakespeare’s whereabouts and activities from 1585 to 1592 is totally lacking,” Oscar James Campbell writes in The Reader’s Encyclopedia of Shakespeare (1966), adding that “nothing can be confirmed” about the Stratford man’s life in that period. 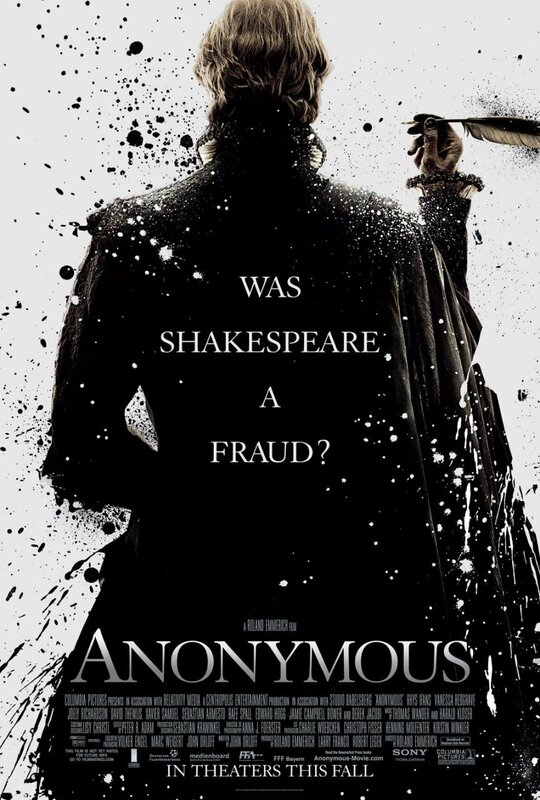 Traditional biographers have had a terrible time trying to explain how “Shakespeare” was anonymously writing early versions of his plays for Her Majesty’s company in the 1580’s. 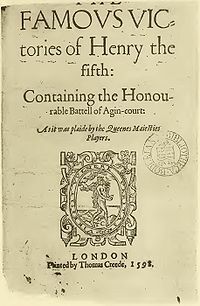 Some have suggested he must have joined as an actor and memorized the anonymous plays; then in the 1590’s, they propose, he drew upon his memory to plunder the plots, characters, scenes and even the lines of those stage works, which would mean that the greatest writer of the English language must have also been the most successful plagiarist in history! 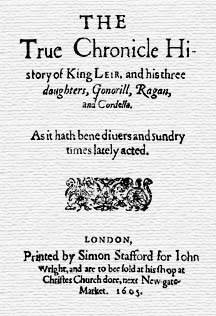 "The True Chronicle History of King Leir" was performed by the Queen's Men in the 1580's (but published in 1605) and transformed by "Shakespeare" into "King Lear"
But some few scholars have bravely stated the far more realistic conclusion that Shakespeare himself wrote those earlier versions of his own plays. 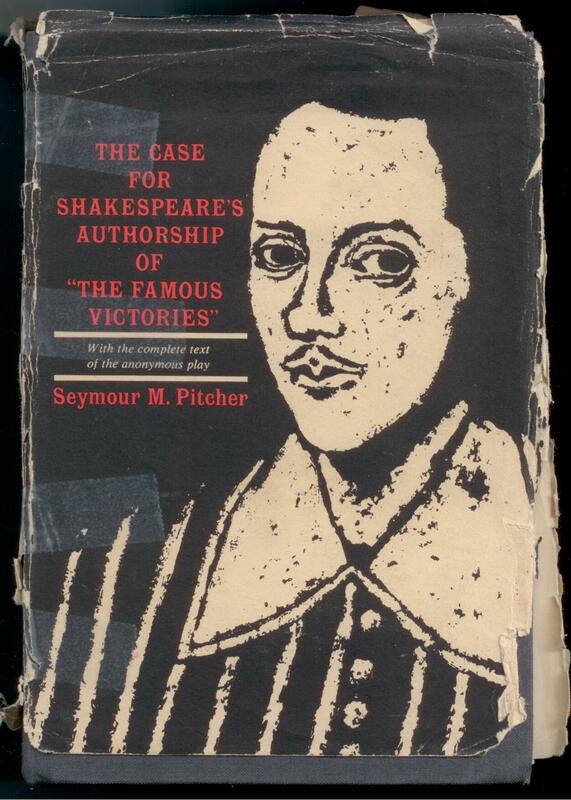 In 1961, for example, Dr. Seymour M. Pitcher at Harpur College in New York wrote an impressively argued book The Case for Shakespeare’s Authorship of “The Famous Victories of Henry the Fifth”. Orthodox scholars have ignored Dr. Pitcher’s suggestion, because it requires Shakspere to join the Crown’s prestigious acting company too early to be plausible. Fresh from his life in the market town ninety miles from London, age twenty in 1584, he turns out plays of English royal history about monarchs such as King John, Richard Third, Henry Fourth and Henry Fifth – a miraculous example of pulling oneself up by the bootstraps, if there ever was one. In the second part of Reason No. 12 we’ll take a look at the Earl of Oxford’s activities in relation to the Queen’s Men in the 1580’s and the likelihood that he was contributing those anonymous, early versions of plays which he himself would revise later, for eventual publication under the “Shakespeare” pen name.